There was a little bit of a winter lull, but recently, I’ve been getting a few packages in my mailbox from you kind people. That means I need to be even more diligent in getting caught up with my existing backlog of trades. I’m getting closer, if you don’t count all of those multi-post trades that I’ve introduced but haven’t finished showcasing. Well, today’s quick post needs no second part. It doesn’t even need a second card. Back in October or so, I think, I worked out a trade with Adam from ARPSmith’s Sportscard Obsession. In one of my rare spurts of reading blogs (sorry, everyone. I do want to be better about being consistent and commenting), I noticed that he pulled a certain card out of 2018 Fire that I wouldn’t mind getting my hands on. 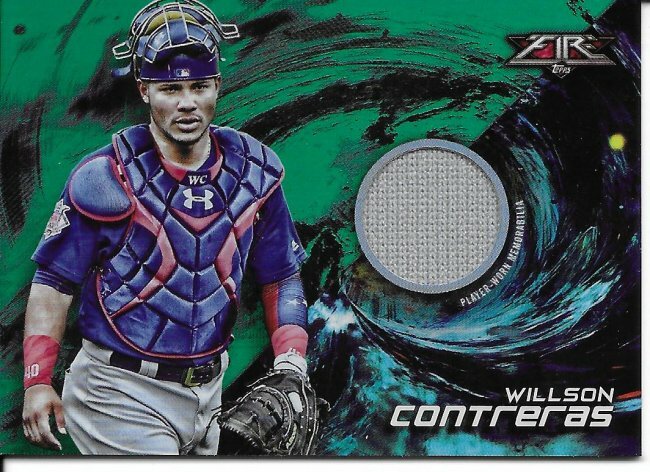 For a retail only product, there are far too many relic and autograph combinations and parallels, and I imagine that many of them will not see the light of day for a while (I imagine a percentage is being hoarded for future sales based on a big rookie class or some crap). I’m also hoping that in future years, I’ll find a good portion of these in card show boxes after the hype and star power has died down. For now, I was happy to send over whatever it was I sent in exchange for this Green relic #/75. I’m not sure how green relates to fire, but that’s not important. The important thing is that this one has been obtained. Thank you very much, Adam! Hope we can work out another trade again sometime. Fire? It kind of reminds me more of a vortex. Lately… a polar vortex. Nice addition though! That’s a good call! Maybe they should do Topps Ice this year instead.